Note: We apologize for the delay on this product. Our Quality Assurance Team is currently screening for a clean lot of this item. Should be back in the store by end of April 2019. We do appreciate your business with us and your patience while we complete this process. The Health Ranger's Chief Originals Vitamin D3 (5,000 IU) veg capsules have been fully lab tested for heavy metals, microbiology and glyphosate. They are free of magnesium stearate, preservatives and additives, and contain no allergens, glutens, or GMOs. 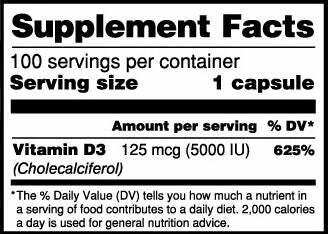 Learn more about Chief Originals Vitamin D3 125mcg (5000 IU)! 1) Supports healthy bones – Vitamin D3 regulates and controls the body's absorption of calcium and phosphorus, the two compounds that are necessary for strong and healthy bones. 2) Supports a healthy immune system – Vitamin D is well known to help strengthen your immune system and facilitate its normal functions. 3) Balances and uplifts mood – Vitamin D3 has a tremendous effect on supporting positive mood. 4) Supports optimal health of infants – Vitamin D3 plays a vital role in the normal growth and maintenance of the skeletal and immune systems of growing infants. It is essential for the proper development of small children. 5) Supports optimal health during pregnancy – Pregnant women need adequate amounts of vitamin D3 for their own personal well-being and to ensure the healthy development of their babies. 6) Supports healthy respiratory system – Studies suggest that high levels of vitamin D are associated with healthy lung and respiratory functions. 7) Supports healthy brain function – Vitamin D3 regulates the absorption of calcium, which plays a role in transmitting nerve impulses to the brain. Studies also suggest that adequate levels of vitamin D may be linked to optimal cognitive function. Suggested Use: Take 1 capsule daily with food or as directed by your healthcare professional. Non-Active Ingredients: Rice Complex (as Rice Flour and Rice Hull Powder), Hypromellose (Capsule). Storage: Keep bottle closed in a cool, dry place out of direct sunlight. Caution: These capsules are not suitable for children. Explore More About Health Ranger's Vitamin C! !